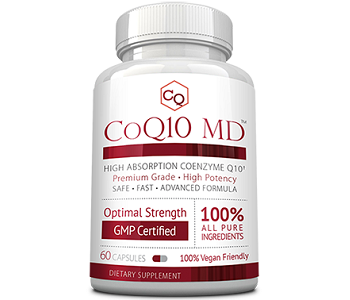 In our review of GNC COQ10, we will find out if this product lives up to its manufacturers and customers expectations. 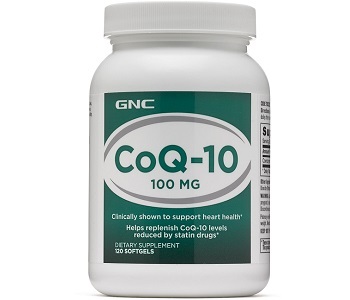 According to the manufacturer, this variant of the COQ10 supplement is clinically proven to improve heart health by replenishing CoQ10 levels reduced by statin drugs. Let’s find out if these claims are accurate and if their customers agree. Although the additional ingredients found in this supplement are natural by nature, they do have the tendency to act as fillers which can lower the potency of the supplement. Many of the other supplements found on the market do not contain any additional ingredients which tend to provide a higher potency and better absorption into the body. The manufacturer recommends taking between 1 and 4 capsules daily after meals. This dosage equates to between 100 mg to 400 mg of COQ10 of which the lower dose tends to be too little and the higher dose too much. We were unable to find mention of possible side effects from the manufacturer. Research shows that a dosage of 300 mg or more may cause side effects such as rashes, nausea, abdominal pain, dizziness, sensitivity to light, irritability, headaches, heartburn, and fatigue. Consumers should also take note of the filler ingredients such as soy which is an allergen and people that are allergic to these allergens may suffer additional side effects. Pregnant women or people who have a known medical condition should always consult their doctor before taking this supplement. The price for this product varies based on quantity and frequency, for example, purchasing 60 capsules once-off costs $18.99 excluding delivery fees, however, if you opt for their delivery frequency option which delivers to you every 30 to 180 days the manufacturer will give a 10% discount and provide free shipping. Autoship programs such as these tend to come with hidden costs and are difficult to cancel. The manufacturer offers a 30-day money back guarantee. This guarantee policy only includes the full purchase price of the product and they will not refund you for any shipping, handling or any other costs that may have occurred other than the purchase price of the product. The manufacturer does allow returns of opened and unopened packages if the package is in good condition and all paperwork is included. In our review, we found a variety of positive and negative comments by consumers who have tried the product. Many negative reviews revealed complaints about price, the effectiveness of the product, and problems with customer service with respect to delivery. Our biggest set back is the filler ingredients used in the product which reduces the likeliness of the product’s effectiveness as the fillers tend to lower the potency and absorption into the body. In addition to this, the lack of information on side effects causes some alarm particularly with the highest dosage they recommend being 400mg. Studies have shown that a dosage above 300 mg can cause unwanted side effects, there is no information about this fact anywhere on the manufacturer’s website.